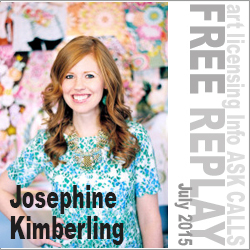 HERE IS WHAT WE GOT TO HEAR FROM THIS WEEK’S CALL WITH JOSEPHINE KIMBERLING . . .
We l earned of her exciting and unique journey into art licensing, and her thoughts on her in-house positions at both Nordstrom and Hallmark. How do you balance trend research and personal style? Where to you go to find upcoming design and color trends, so that your work hits the market before trend becomes commonplace and tired? How do you stay relevant to today’s consumer? In regard to targeting specific industries, how do you find partners and what is the most important thing you can do when presenting your artwork? Can you describe your art creation process? Where do you recommend someone start when entering into the world of art licensing? What trade shows do you attend or exhibit? Do you copyright your designs regularly, including all variations and color ways? Is it common to ask for an Advance when entering into a License Agreement? Can you negotiate royalty rates? What is the single best learning lesson you can share with everyone? If you were signed up for the call, you should have received an email with the playbacks. If not, please register for the replay here. 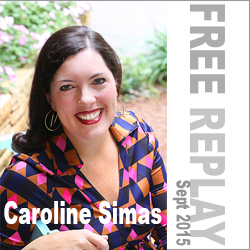 Caroline Simas is a licensed artist, wife and mother of four in Charlotte, North Carolina, whose designs and patterns appear on a variety of products for the home décor and gift industries. Her faith-based brand, Multiple Blessings, has taken the industry by storm as Caroline’s art and messages of inspiration resonate with many, bringing joy and faith into homes worldwide. She has developed varied and distinctive styles in watercolor, gouache, mixed media, abstract, pen & ink and more. Create Art. Create a Strategy. Create Income.